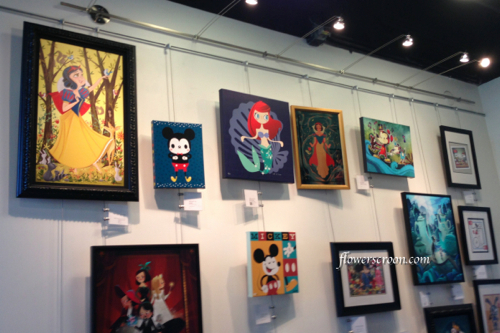 While at Disneyland in June, and during one of my (many) shopping days at Downtown Disney, I popped my head into the lovely WonderGround Gallery. This is one of my favorite shops in Downtown Disney and definitely one of my favorite galleries in California. The variety of media and pieces are truly original & stunning interpretations of the Disney animations we love. Everything from small prints and gifts to deluxe prints, limited edition pieces and books can be found in this little gem. The coolest part? Meeting the artists! Once a month the gallery features a different artist who will sign their pieces events like artist signings. During this visit I was captivated by the system created to display the art against the wall featured above. We have such a beautiful, eclectic and diverse art collection of our own at home, but I constantly struggle with methods to creatively display everything. This particular installation is perfect for us because it is fluid, not static. It can never be boring or stale because it can evolve as more art is acquired, seasons change, etc. I love it! Little did I know that I would meet the Cast Member who manages the gallery later that night at the SHAG cocktail party. I was so excited to show her this photo and get her ideas on how I can do this at home. She explained it was a simple cable system and gave me some tips on lighting and displaying. I'm excited to give this a try one weekend this fall or winter when we've finished painting.